The Burvixese were a civilization of turtle-like aliens who once lived on a swampy world of Arcturus I. They were a relatively benevolent, highly technological race who, instead of traveling between stars, talked with other races via HyperWave in the safety of their own homes. They were in friendly contact with many neighbouring civilizations, including the friendly Gg, the enlightened Utwig and, unfortunately, the vile Druuge. This state of affairs persisted for several decades, the Burvixese peacefully trading technological, historical and philosophical facts and theories with the other races, until the year 2142. The Gg's HyperWave transmissions had attracted the attention of a murderous race known as the Ur-Quan Kohr-Ah and, to their horror, the Gg noticed that the Kohr-Ah were closing in on them. Before their end came, the Gg warned the Burvixese of the danger, and the Burvixese in turn warned their closest neighbours, the Druuge, whom, the Gg explained, the Kohr-Ah had already detected. 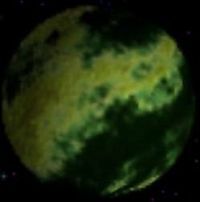 But the Druuge did a truly evil deed to ensure the salvation of their own wretched civilization: immediately, they shut down all their HyperWave transmitters and sent their fastest ships to the moon of the Burvixese homeworld. There they planted a powerful Hyperwave Caster. The Kohr-Ah turned their interest from the Druuge to the homeworld of the Burvixese, who were eradicated in three days of orbital bombardment. The arrival of the Ur-Quan Kzer-Za into the same area of space prompted the immediate resumption of the Doctrinal War, and the Druuge, having brought about this ghastly second-hand genocide, were forgotten by the Kohr-Ah in what followed. This page was last edited on 28 July 2015, at 03:51.